At Architectural Fibreglass Mouldings Ltd, we pride ourselves on always answering to our clients' needs, no matter how complex. 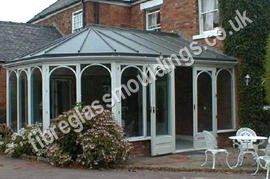 Our range of GRP porch canopies & tops is as comprehensive as you would expect from a company with our level of experience in canopies and porch tops. UK customers have come to trust our extensive range of GRP products, including door surrounds and a variety canopy solutions. We are proud to be recognised as leading UK manufacturers in this area and as such can guarantee the lifetime of every one of our door & canopy products. 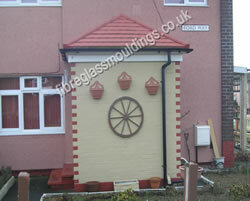 We choose to work with GRP it is proven to be both durable and cost effective. Transforming any property within minutes, installing a door porch canopy takes no time at all and provides instant protection for you, your guests and your door from the elements. Our window and door porches can potentially add value to your property and is a maintenance-free choice of home improvement. 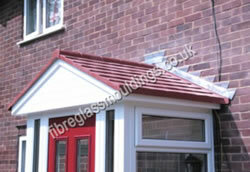 For example, our range of porch tops gives UK customers a wide range of choice when it comes to style and colour. 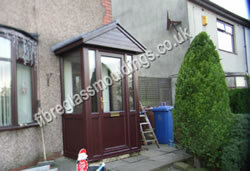 You can even cover any previous canopy scarring immediately and improve the look of your property instantly. 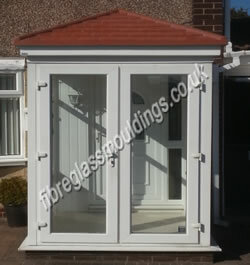 We currently carry styles such as the Apex roof style, the Flat Roof canopy and the Mono pitch porch top. UK customers may also be interested to look at our products, which are available in larger sizes such as the Mono Pitch. 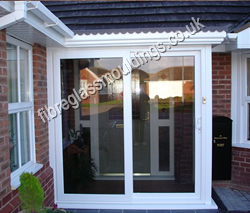 Below are the most popular door porches we offer. 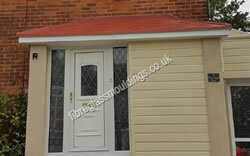 We can manufacture GRP porch tops to suit most applications. Please contact our customer care team on 01254 357000 for more information on specific products or for advice on which product is right for your property. 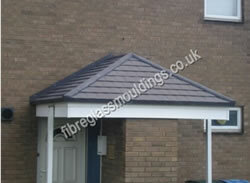 Fitting our canopy products saves our clients time and money and gives the client a maintenance free product. Choose the correct colour (Click here to view). Read the appropriate measuring instruction and fitting instruction. When placing an order please confirm the location of the outlet to connect your downpipe on to. Any size available, please ask for details. 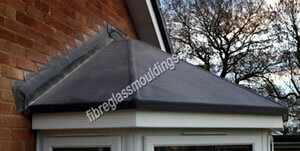 An attractive seamless lead effect porch canopy eliminates all the problems of short life span of felt. Roof is tough and durable and can be used for bay tops, porch tops and flat roofs. 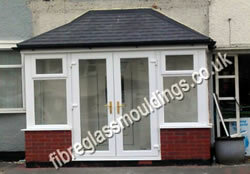 This system can be installed with ease by any tradesman and can be done to any size or porch top. An attractive seamless lead effect Bay elimi-nates all the problems of short life span of felt. 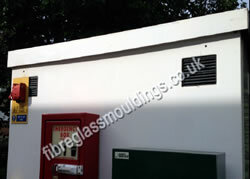 This system can be installed with ease by any tradesman and can be done to any size or Bay top. 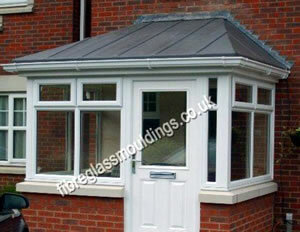 A beautiful hipped style over-door canopy with an authentic Rosemary tiled roof detail. Designed to go over Bay Windows & Porches. 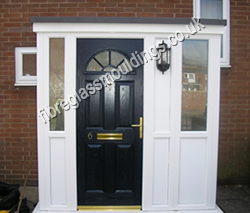 Contact Us now to find out more about our GRP door porches, porch canopies & tops.